Because essential oils are so popular, there are an insane amount of products out there. Unfortunately, they’re not all very good. If you’re looking for best smelling essential oils for skin, hair, or aromatherapy, you want to make sure you’re getting the best product possible. That’s why we spent so much time looking for the best products out there and put together this guide. First, here are some key things to keep in mind when shopping. Bottles: All of these products are sets that include anywhere from 6 to 14 different scents. Since every essential oil has a different scent and application, we liked the idea of having a lot to choose from. Bottle Size: These sets come with either 5 or 10 ml bottles. A little goes a long way since you only use a few drops at a time so 5 ml is enough but go for the bigger bottle if you want more. Scents: As we mentioned, all of these are sets include anywhere from 6 to 14 different scents. The vary from bottles of individual oils like peppermint, frankincense, and sweet orange to special blends like Good Sleep, Stress Relief, and Mood Enhancer. Organic: These oils are sourced from various places all over the world so it’s hard to find a set that contains only organic oils. That said, we did manage to find one that’s FDA Certified Organic. 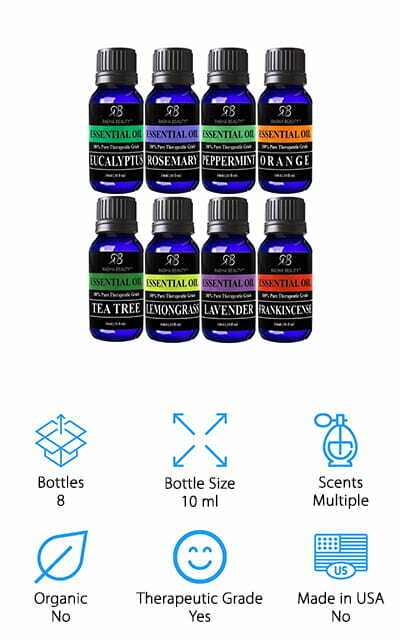 Therapeutic Grade: All but one of these oils is considered therapeutic grade. Generally, this means that the oils are not watered down, and don’t contain any additives. In other words, they’re as pure as they can possibly be. Made in USA: Some of these oils are made in the USA, some aren’t. Because of the vast range of scents included in these kits, some of them are sourced from all over the world rather than from the USA. Now that you know a little bit more about what to look for, let’s get into our reviews. If you’re in a hurry, the best thing to do is start right at the beginning. We put our top and budget picks first so you can quickly see the range that’s available out there. All of these sets are different and have something unique to offer, though, so stick around if you can. Are you ready? Let’s go! For some of the best smelling essential oils to diffuse, you have to check out our top pick, the doTERRA Family Essential Kit. It comes with a nice variety of scents, each in a 5 ml bottle. They’re all therapeutic grade and specially chosen to help your family live as healthily as possible. So, what scents come in this kit? You get one bottle each of lavender, lemon, peppermint, melaleuca, oregano, frankincense, deep blue, doTERRA breathe, DigestZen and doTERRA On Guard. These oils are all great in a diffuser and most of them can also be used topically as long as you mix them with an appropriate carrier oil. One more thing, if you’re looking for something that would make a nice gift, this is a great option. 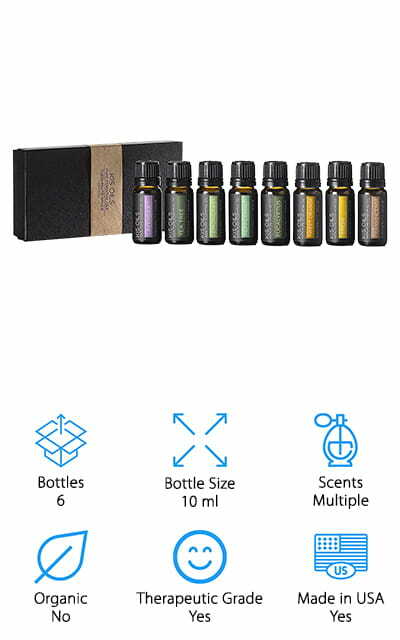 If you’re looking a kit that has a wide variety of scents at a reasonable price, check out the Artizen Top 14 Essential Oil Set. You might be wondering what’s included. Well, you get 5 ml bottles of lavender, frankincense, eucalyptus, cedarwood, sweet orange, rosemary, lemon, peppermint, tea tree, and special scents like their breathe blend, good sleep blend, stress relief blend, and muscle relief blend. Plus, you get a bottle of robbers oil, a combination of cinnamon, clove, eucalyptus, lemon, and rosemary. Each comes in a colored glass bottle for protection against light degradation. These are therapeutic grade and ideal for aromatherapy and most can be used topically with the right carrier oil. They’re covered by a lifetime warranty, too. If you’re not happy, return them for a refund or replacement. This essential oils kit from Radha Beauty contains 8 amazing oils, including some of the best smelling essential oils for hair. One of the great things about this set is that it comes with large 10-ounce bottles when a lot of kits only give you 5 ml. Included are lavender, tea tree, eucalyptus, lemongrass, orange, peppermint, frankincense, and rosemary. Rosemary, in particular, is great for your hair. These oils can be used in a variety of ways. Try them in a diffuser, add a few drops to your massage oil, or blend them with a carrier oil for an easy way to use them topically. 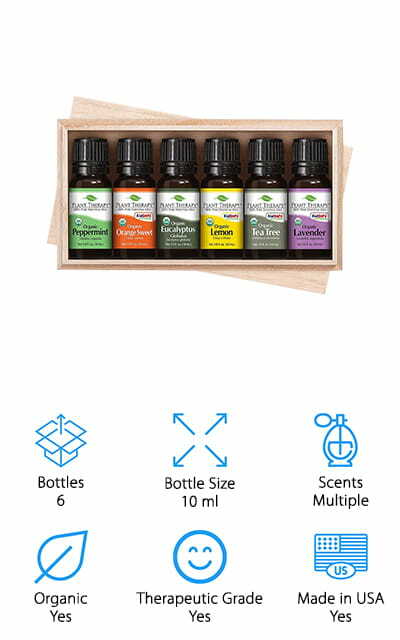 This is a good set for gifting, especially for someone who is new to essential oils. This kit has a nice variety and the packaging is gorgeous. 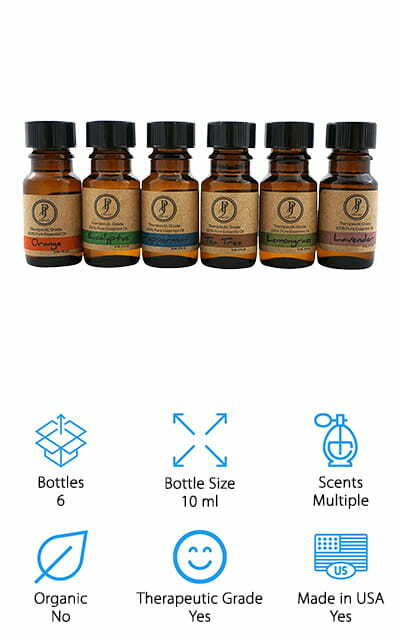 The Healing Solutions Essential Oil Set is a set of 6 clean smelling essential oils that come in 10 ml bottles. These are great for aromatherapy or topical application with massage oil or carrier oil. 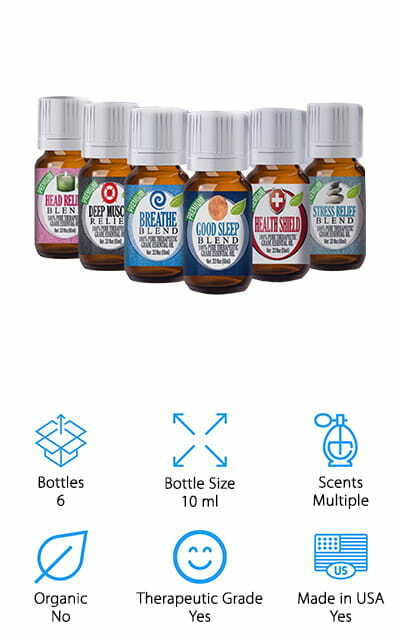 The blends that are included in this set are all aimed at improving your life and include Breathe, Good Sleep, Head Relief, Muscle Relief, Stress Relief, and Health Shield. Each of these is made of a special mix of essential oils to deliver the best therapeutic results. They all have their own unique scent and are potent without being overpowering. One of the best things about this kit is that it’s covered by a money back guarantee. If this is your first time trying the product and you aren’t completely satisfied, Healing Solutions will refund your money, no questions asked. Another great set of fresh smelling essential oils that we loved is the Natrogix Bliss Essential Oil. It includes 9 bottles of therapeutic grade essential oils that can be used individually or blended together for aromatherapy or added to a carrier oil for topical use. And get this, they even include a recipe book with 200 different blends for you to try! Here’s what you get: tea tree, lemon, lavender, sweet orange, rosemary, lemongrass, frankincense, peppermint, and eucalyptus. All are pesticide and herbicide free and don’t contain any GMOs. This set comes in a beautiful box that’s perfect for displaying or giving as a gift. Each bottle comes with its own dropper to get just the right amount for each application. Plus, the bottles have a gold/amber tint to protect the oils from light and UV degradation. This gift set of Kis Oil contains some of the best smelling essential oils for perfume that we found in our research. 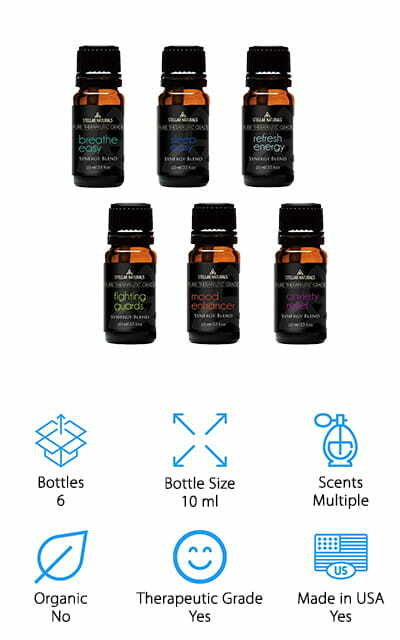 Each of the 6 oils in this set is therapeutic grade with no additives and no fillers. Each bottle is 10 ml and they come packaged in a nice matte black box that’s suitable for gifting. What’s included? You get a bottle each of lavender, sweet orange, peppermint, lemongrass, tea tree, eucalyptus, lemon, and frankincense. The bottles are made of amber glass for protection against harmful UV light and each comes with a 10 ml dropper. This is a great set for perfumes, oils, and lotions or used in a diffuser for aromatherapy. One more thing, it also comes with a 100% money back guarantee. If you’re looking for floral smelling essential oils, you have to check out this Plant Therapy Essential Oils Set. As you might guess from the name, each of the 6 scents is derived from a different plant. You get a 10 ml bottle of eucalyptus, lemon, peppermint, sweet orange, tea tree, and lavender, and get this: they’re all USDA certified organic. These oils work well when used in a diffuser and have a wonderful smell that’s not too strong or overpowering. You can also use some of them topically when mixed with a carrier oil, massage oil, or even perfume base. One thing that we really liked about this set is the packaging. The bottles fit snugly in a small wooden box that’s perfect to display and makes a really nice gift. The Stellar Naturals Essential Oil Blends set features some strong smelling essential oils that aren’t overpowering. This set contains 6 different 10 ml bottles of various blends. You get Breathe Easy, Sleep Easy, Refresh Energy, Fighting Thieves, Mood Enhancer, and Anxiety Relief. These are all therapeutic grade blends carefully put together to create different experiences. Use Sleep Easy in your diffuser at night, Refresh Energy in your kitchen in the morning, and maybe mix a little Anxiety Relief or Mood Enhancer in with a carrier oil and rub it into your skin to help you get through your day. Each oil comes in an amber glass bottle for protection against UV light and includes a dropper for easy and precise application. That’s not all, this set is also covered by a 100% money back guarantee. 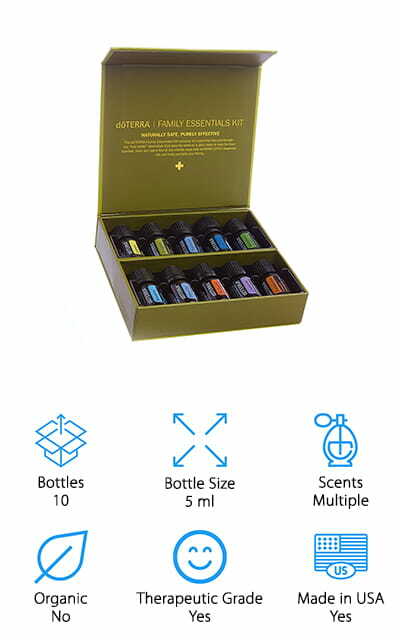 This Pure Jolly Essential Oil Kit is a great set if you’re looking for fall smelling essential oils. It includes warm, spicy scents like lavender, tea tree, eucalyptus, peppermint, lemongrass, and sweet orange. Each is 100% pure, therapeutic grade and contains no additives or fillers. Quality essential oils can degrade if they’re exposed to direct sunlight which is why each scent comes in a 10 ml bottle made of amber glass block out the UV rays. You can use these oils in aromatherapy with vaporizers or diffusers or mix a few drops with massage oils or carriers and apply directly to your skin. This is a great kit for beginners and would make a nice gift. One more thing, Pure Jolly offers a 100 day no hassle 100% money-back guarantee. 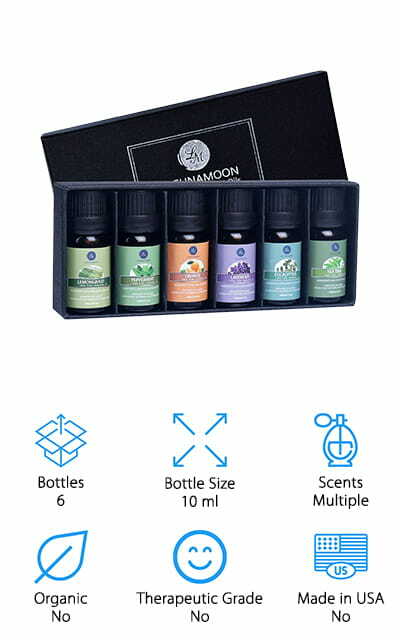 Last up is this great set of sweet-smelling essential oils from Lagunamoon. This is a great set that includes 10 ml bottles of 6 different scents: lemongrass, peppermint, orange, lavender, tea tree, and eucalyptus. You can use each on its own or mix to get the perfect blend to suit your needs. Each oil comes in an amber glass bottle to keep it protected from any harmful light that can affect the potency or the oil. You can use these oils for aromatherapy or mix them with your favorite soaps, creams, and lotions or even add a few drops to your bath water to experience a spa-like calm at home. This is a really nice set that comes packaged in a simple black box with a lid that would make a great gift.